SEBRING — Last Wednesday, Lake Ashton met Riverbend of Labelle at Highlands Ridge to reduce the drive time for both teams. 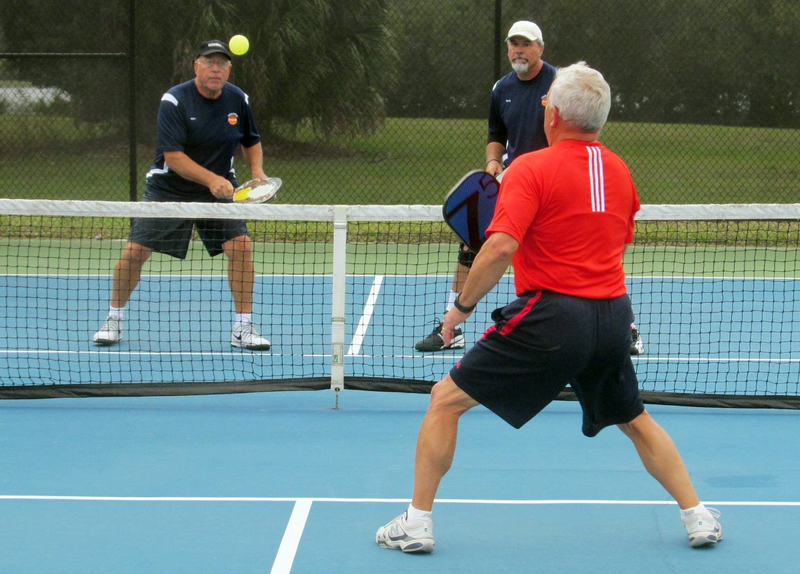 Lake Ashton earned their second win of the season by a score of 51-16 in South Central Florida Pickleball League action. Tanglewood played at Sun ‘n Lake on Sunday and captured 62 of a possible 67 points on the strength of four wins by each of their top three teams; (A) Wayne Buck and Mike March, (B) Mark Telfer and Grant McLaughlin and (C) Randy Crawfis and Gary Sewell. Tanglewood’s D team forfeited their first game to Barb Taylor and Linda Kramer of Sun ‘n Lake when Dennis Rowland injured his foot. His partner, Debi Yandell, then played with sub Neil Simpson, losing both games to the Sun ‘n Lake tandem of Ross Myles and John Prentice before defeating Gene Timmerberg and Tom Kryston and followed that up with a victory over Ellen Nesbitt and Dave Linderman. It seems there are two types of people in the world: those who know about pickleball, and those who don’t. But the number who know about the sport — and are getting on the courts and playing — is quickly increasing. It’s been called the fastest-growing sport in America. 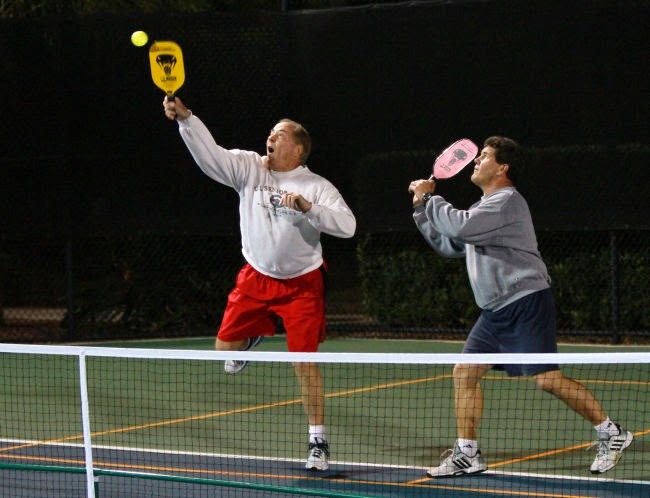 Pickleball is described as a combination of tennis, badminton and pingpong. The game is played with a solid paddle and a plastic, perforated ball resembling a Wiffle ball. Because pickleball is low-impact but gets the heart rate going, it’s becoming especially popular with the 50-and-up crowd. Catalano, who is 72, has been playing for five years. Until he picked up a paddle, he had never heard of pickleball either. Ambassadors are volunteers who have pledged to promote the sport of pickleball and the USAPA in the local area they represent. Each Ambassador serves as a spokesperson and representative for the USAPA and supports and abides by all rules, policies, goals and the Code of Conduct as established by the USAPA. SEBRING — Clayton Farrar, chair of the Tanglewood Winter Classic Pickleball Tournament, announced recently that plans are well underway for the third edition of the event. The age brackets have changed from previous years. They are now 19 to 49, 50 to 59, 60 to 69 and 70 and over. Doubles teams entering must play in the age grouping of the younger player. In order to encourage new players to try the tournament experience, Clayton is urging beginners to sign up in the 2.5 skill level where they will meet up with other similarly skilled players. Partners must play in the skill level of the better player. There will be competition at each level: 2.5, 3.0, 3.5, 4.0, 4.5 and 5.0. Those rated 5.0 are the highest-rated players. 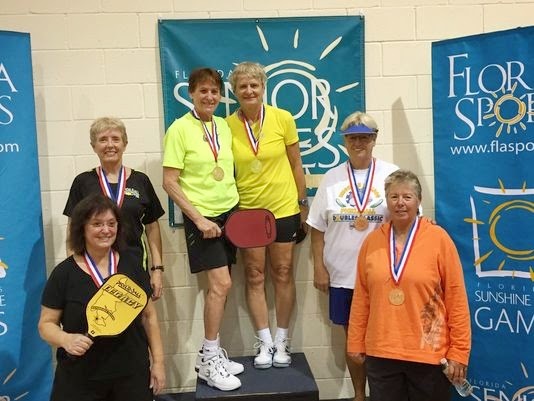 SEBRING — The South Central Florida Pickleball League was established five years ago to allow the better players to improve their game by having regular opportunities to compete at a higher level. This year, the league has expanded to six teams from five with the addition of Sun ‘n Lake. The returning teams are: Lake Ashton, Del Webb/Orlando, Riverbend/LaBelle, Highlands Ridge and Tanglewood. On Thursday, Riverbend met Tanglewood in the first match of the season. The games were played at the eight-court Sun ‘n Lake facility. Each team consisted of four pairs ranked A, B, C and D.
In the round robin series, each team played a best two out of three sets against each other team. The complex scoring system awards more points for the games between evenly matched teams. The greatest number of points is earned in the clash between the top two teams. 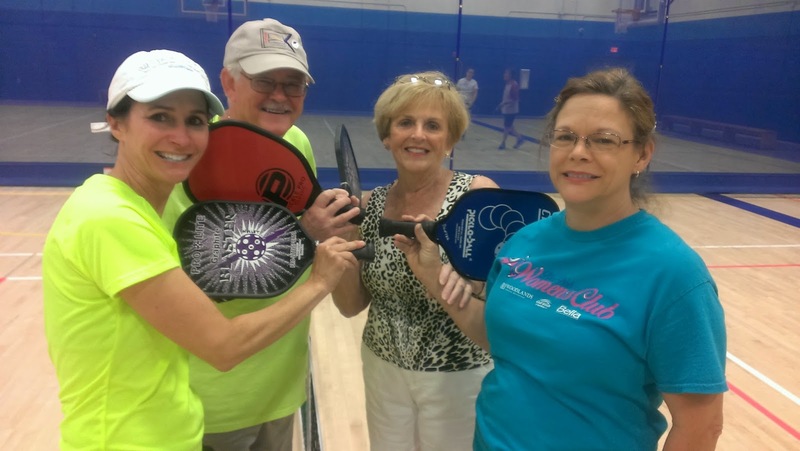 Pickleball is alive and well in Florida’s Capital City and a group of local players ventured south to test their skills at the 2014 Florida International Senior Games & State Championships. 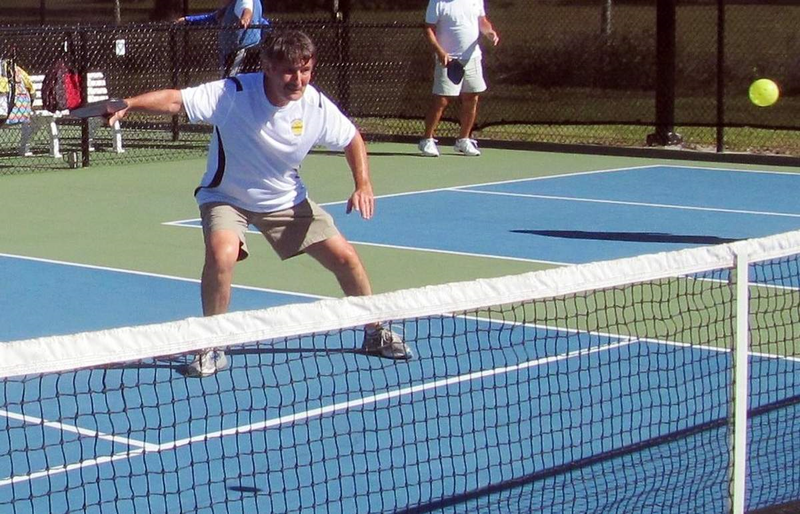 A sport on the State Championships roster since 2003, only in the last couple of years has Pickleball become a favorite among Tallahassee’s senior athlete community. 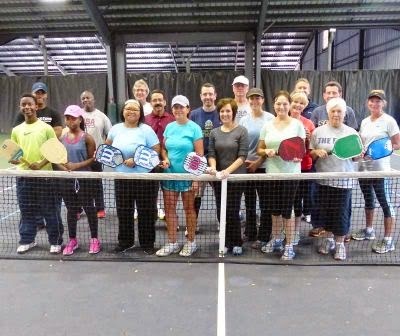 More than 33 hours of Pickleball was played at the 2014 State Championships on nine courts, in Singles, Men’s and Women’s Doubles and Mixed Doubles. It was an eye opening experience for the Tallahassee contingent who play the game on a recreational level at the Tallahassee Senior Center, Jack McLean Park, Lafayette Park’s Sue McCollum Center and Premier Fitness. BOYNTON BEACH, FL (BocaNewsNow.com) (Media Advisory) — The Boynton Beach Recreation and Parks Department’s Ezell Hester Jr. Community Center, 1901 N. Seacrest Blvd., is offering the exciting and fast-paced sport of Pickle Ball on Monday, Wednesday and Friday mornings from 9:00 a.m. until 1:00 p.m. There is a cost of $5.00 per player, and the games are played indoors. Paddles and balls are furnished to those who need them but available equipment is limited. 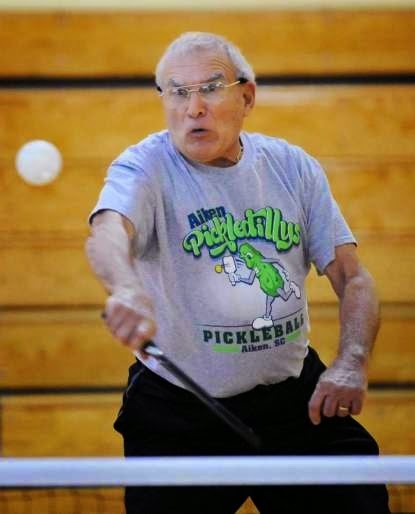 RALEIGH — Dudley Kay returned to Raleigh from an extended vacation at the start of the new year with the pickleball bug. Kay, 68, couldn’t get enough of the game that’s similar to tennis but is played on a smaller court with a paddle and a Wiffle-style ball. 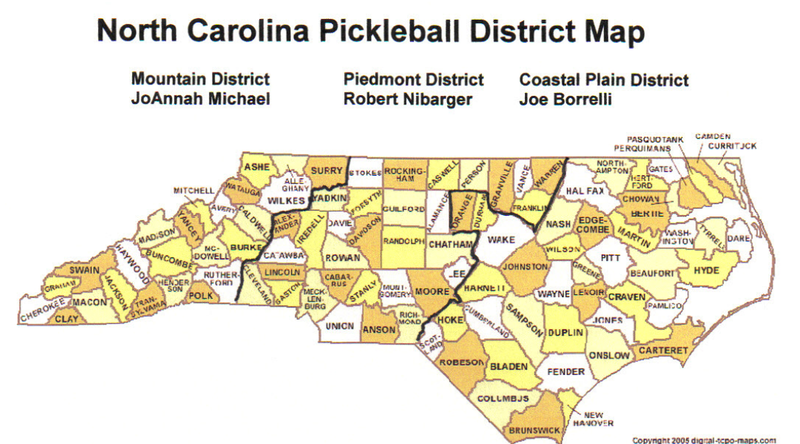 While in South Carolina, Kay and his girlfriend played pickleball nonstop. As soon as they got back, they immediately went online to find out where to play locally. Dr. Tom and Ann Earley met with Sheriff Joe Arpaio to present a check for $1000 to the M*A*S*H unit in Maricopa County, Phoenix, Arizona. This check was half of the proceeds of the fall tournament for the North Georgia Pickleball Club (NGAPC). The other half of the proceeds went to the Cherokee humane society in Canton, Georgia. Each year the club has a fall tournament with 100% of the proceeds going to a charitable organization. The old jail at first Avenue and Madison Street in downtown Phoenix was repaired in 1999 and put in air conditioning and had the cells fixed up to care for the Maricopa Animal Safe Hospice, a no-kill shelter intended to care for animals that have been neglected or abused by their owners and thankfully rescued by the animal cruelty investigative unit. These animals are in legal limbo until their owners' cruelty cases are decided in court. After that, hopefully, they will be adopted into decent, loving homes. M*A*S*H also houses, for up to 60 days, the pets of individuals who have been forced to take refuge in domestic violence shelters that do not accept pets. While the M*A*S*H program is designed to care for the animals, it has a powerful effect on some of the inmates as well. Inmates are allowed the opportunity to care for the abused animals, to groom, feed, exercise, train, and nurse them. The point of this considerable effort is to create a bond between the inmates and the pets, to have the inmates not only take responsibility for the well-being of another living creature, but also feel compassion for something other than themselves. It works, more often, than not. The M*A*S*H unit is part of the adult inmate program section that works in conjunction with community groups to give the prisoners a new lease on life. NGAPC is proud to be a part of this effort. 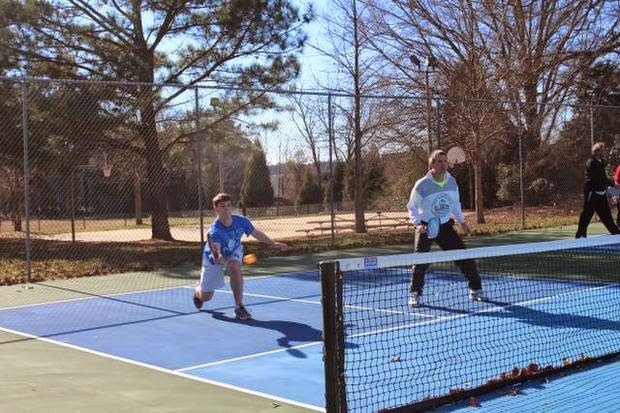 A free demonstration of Peachtree City’s (GA) new pickleball program is scheduled for Thursday, Jan. 8, at 10 a.m. at the Kedron Fieldhouse and Aquatic Center. “[This event] will allow participants to get hands-on experience and learn just how great this game is for all ages,” a pickleball spokesperson said. Members of the PTC Pickleball Club will provide the equipment and their expertise to get attendees quickly into the swing of the game.